Back in Northern Luzon Island and the home for Caleb Ministries in The Philippines, the Eloheim Covenant Church in Santa Maria, we are settled in for a few days from the home base. “Drugs end all dreams = dead” is the common slogan seen on signs in Barangays (villages) in the middle areas of Luzon Island as the drug war is becoming more prevalent in this area. We serviced the car in San Fernando on Tuesday as planned. It took nearly four hours to complete the warranty service so pretty much used up the day as we had to pack and arrange things for our trip to Pilar on Wednesday and Thursday. The 74 LBC Boxes we shipped from Seattle on January 2nd and 3rd arrived containing relief supplies, candy packs, as well as the 9,000 Tee-shirts so we forwarded them on to the recipient churches throughout The Philippines, including Tocloban, Omroc City, and Cebu where we had visited earlier on this trip. Text messages were sent to many local groups to come and pick up the supplies at Santa Maria on Friday when we returned from Pilar. The Tuesday evening program was postponed until Friday night. Wednesday we went to Pilar, a steep climb on rugged dirt roads up the mountain in the remote hills of Abra. The vehicle we used is best described as a flatbed four-wheel drive truck on steroids! I was amazed to see this beast of a vehicle literally climb the mountain terrain. The driver is truly a pro and knows his roads! We arrived the first night to stay at the village Nanangduan which is translated “Mother, the hen has laid two eggs so far,” giving you some concept of the fantasy world we had entered! We stayed in a large timber house with open living area and a loft with two bedrooms and an open dormitory room where much of the team slept on the floor. Our team was Marben and I, Pastora Edna from Bangar (who is originally from Pilar), two others from Pilar, and about ten of the seminary Pastors and Pastoras from Santa Maria who came on motorbikes bringing supplies. Dinner was cooked by the team and the host family and consisted of many different vegetables and fruits, rice, and chicken. We brought coffee packets with us and of course bottled water. Following dinner we went to the meeting area which the young team members had set up, including lighting and microphones. About 200 attended the revival meeting, including the Barangay captain (mayor) and several civic leaders. The preaching yielded about 30 adults coming forward to receive Christ, many slain in the Spirit, and a true revival feeling for the village. The local pastors were very excited and grateful for the program. Thursday afternoon we moved on to the village of Occop which means “Mother, the hen is setting.” Here we set up on a large field, again with the team arranging microphones, lighting and chairs and benches. I would guess we drew perhaps 350 to 400 this last evening, including several local Barangay captains, a congressman, many pastors and officials. The result was as the night before except that after the sermon on Acts 14 and 16, literally everyone came forward at the altar call. I have never witnessed such a complete response in my life. We gave out candy packs, Tee-shirts and food to many before packing up and returning to Santa Maria about 3 am Friday morning. At 8 am Friday, pastors and Bartangay captains and their staff started arriving to receive Tee-shirts and candy packs, continuing throughout the day. At 7 pm I addressed the monthly Interfaith Youth Program and more Tee-shirts were distributed. Then at 11 pm Friday, Marben and I drove south to Manila, dropping off more Tee-shirts and supplies along the way to various churches through the night. We arrived at Antipolo, Manila at 7:30 am Saturday to set up for the 9:00 am service commemorating the second-year anniversary of the Antipolo Church. The service was difficult in some ways because three nights before an 18-year-old boy was fatally stabbed by accident by another 18-year-old boy as they were playing “jousting” with knives. We visited both families involved and provided what comfort and counsel we could, though clearly most were still in shock from the incident. At 2 in the afternoon, we held the first Antipolo Church baptisms, taking 16 kids and 10 adults to a “Water Wonder World” park nearby and performing the ceremony. Then it was back to visit with the two families who were working through their sorrow regarding the knifing incident, and then some sleep after packing to fly out at 10 am Sunday back to the USA. I arrived home with just a minor cough and somewhat worn out, but for the most part very healthy from this long adventure. Clearly, the 2014 Journey to the Philippines was one of the most memorable in my experience. Thank you all for your support and prayers. Caleb Ministry is a team endeavor! Last Friday was so exciting, here are a few pictures from that night for you. This was at Victory Outreach, a new youth church just 8 months old. The Spirit was so strong, people were slain without being touched or even approached. Photos of Roberto Abad wake. He was 91. It is common to play cards or games of chance at a Wake as it shows you cheated death. Additional pictures of breakfast meeting with Governor Singson. On Wednesday, the Bangar Revival meeting & dinner after and Thursday Night Bangar Revival Meeting and Caleb clothes distribution after. At Strawberry Farms, Bengeud, we minister to the Bishop. He takes us next morning to Rebel Territory seminary of 60 students, an orphanage and a school to minister there three days. At morning service, 5 Americans arrive just as lady in orange regains ability to walk! (stroke 4 years ago) Americans from Madison want to join us but Bishop sends them off. Night service (Friday Night Youth) many are healed by Lord and many receive spiritual gifts for first time. Then three photos of orphanage and two of girls cutting used foil wrappers to combine with cloth as pillow fillers. Left remote village called OLD MILL, a former gold mining operation over 7,000 feet up in mountains. Second Report pictures from Grandera where we stayed three nights with Pastor Ramos Family. Services the two nights were revivals. Friday after Phillip left, we had breakfast and then visited the adjoining orphanage, inviting older children to the youth service Friday evening. Marben and Melita and I hired pedicabs to go into town to visit Western Union and have an outing. We stopped at a café where I enjoyed a pineapple crush icey. Marben and Malita shared a fish-calamari dish. We then went to the hospital to pray with the sick and then back to the house. Dinner was spaghetti (for the American) as special treat. It is Filipino style with a heavy sweet tomato sauce and tiny chunks of hotdogs for meat, served with toasted bread. Friday evening youth service in Gardena went well. Many youth were present along with many adults. As expected, the worship music was loud, unsingable, but to their liking. As it got louder and louder, Marben and I began praying for individuals, the Holy Spirit sending many to the floor. As the kids got more and more excited, the worship came to a stop and I was suddenly introduced to speak. I chose my teaching on the calling of Timothy as it generally goes well with young people. The Spirit was heavy and they listened intently as I went through Acts 15 and 16, explaining that in some way we are all monsters or outcastes as we are strangers in this world, passing through. They identified with the message and as Marben called them forward, the anointing and prayer was dramatic and deep. We ended service at 11, a five-hour program which is unusual for the youth, but no one left early! God blessed the evening beyond my highest expectations. One lady really stole my heart. I think the message was extremely significant in her life. She was about 40, had her hair in a bun, and was in a green dress. She was short and “dumpy” in appearance, and obviously had been ridiculed many times for her unusual appearance. Truly and not unkindly, she resembled a hobbit! She came forward crying and held on to my arm. She would not let go even when she went to the floor slain in the Spirit! She got back up and just kept crying and hanging on to me. She motioned for me to anoint her legs and then took off her shoes and just kept asking for more and more. When we ended in prayer she held my hand and kept kissing it over and over! This message obviously was meant for her! We returned to the house for my last evening here and showed videos on my laptop of the Caleb Fiesta Dinner, greetings from recipients of LBC boxes, slides of Africa and Romania trips, and slides of packing parties. At 1 am we went to bed. Here our host is Pastor Danny Montes of Faith Tabernacle Center. They have 85 churches and a seminary. He is 57 years old and carrying on the work of his father who started much of the Mindenau Assemblies Church movement. He moved here in 2002 to assume this church that his father started. Pastor Danny is a character of sorts, very likable, young and enthusiastic. I took a liking to him immediately. The church building is very large with the back half being the “house area” of his family, his mother’s house, and a big room for activities--all in one large warehouse converted to church. Behind is building which houses a Bible School with a dormitory for 31 students. Then there is a small pig farm operated by his wife for income and on the street, a small store, also for income, also run by his wife! It was Saturday night so we rested after dinner of dried fish, rice, and my inevitable oatmeal and mango. My sleeping area is in the mother’s house. Her bed is two doors put together and covered by a sheet with huge mosquito netting! I fear I will never get out! Sunday I am up early and connect on Skype briefly. The family dog here is “Jack-Jack,”a real cutie. I can see Pastor Danny is a little concerned about what I will preach. He introduced me and then went to back ready to re-enter. He need not have worried. The Holy Spirit ran everything and we ended up with a revival service which ran from 8:30 to 11:20 am with many anointed. We had to stop as at 11 am people were waiting on the streets for the second service. They came in and I noticed that my friend Japeth (elder who lead Gander services) had come all the way with friends to join us again. I used the sermon on Deuteronomy plus history of Caleb Ministry at the first service and the story of Timothy at second one. Afterwards, Pastor Danny took us to lunch at a local restaurant. Then, during rest time, he took me to see the Public Market area, his father’s grave, and his daughter’s grave. I was very touched by this. His church that his father started came out of the Seattle Full Gospel movement that I was active in during the late 70’s to early 80’s. We knew some of the same people as did Marlita whose father’s ministry also came from that movement. Faith Tabernacle in Kent-Auburn is the namesake for much of the work here and Don Ostrom, Rod McDowell and Rick Martin are seen as the church planters! At 7 pm Marben arrived from Grander and we had the evening service revival until nearly midnight (curfew). A low pressure area was moving towards us so we decided to go back to Grander at night as it is another typhoon building. Arriving at 3 am, we slept until 7 am. Then we had breakfast with Pastor Ramos. His wife was our host as he was in Cebu getting supplies until this morning so this was my first chance to meet him. There is much going on. A 21-year-old best friend of Pastor Ramos’ son was killed on his motorbike coming back from Calbayog City. Some vandal threw a stone at him and he lost control of the bike. We visited the family and I gave $100 for memorial. 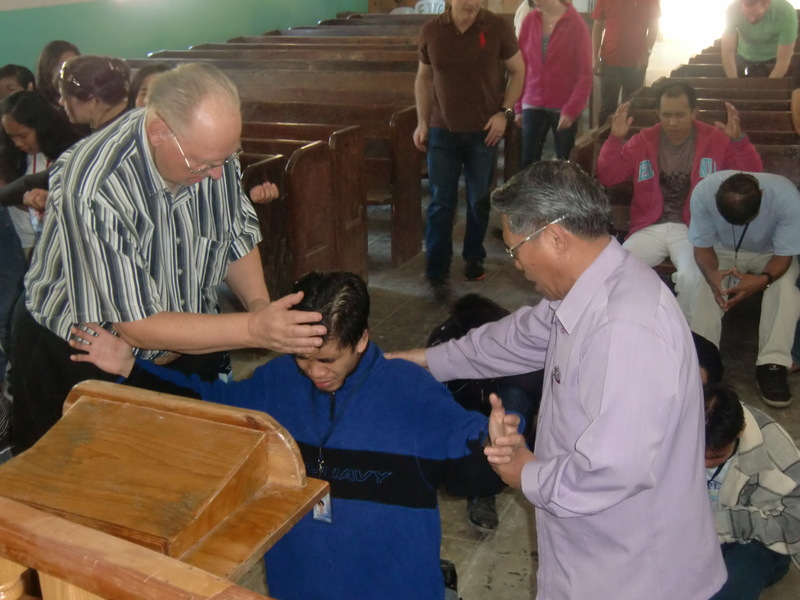 Pastor Ramos introduced us to his brother Paul, whose church was destroyed completely and he asked prayer to restart. He serves an area of 68 Barangays (villages) but the main church was near the shore when Yolanda hit. We then left Grander and Pastor Ramos and his son decided to travel with us as Pastor Ramos wants to know more of me but not leave his son at this time. It is good decision and I have several opportunities to minister to him. The boy is perplexed as he lost another friend not long ago when the motorbike struck a caribou on the road at night! We talk much of the trip and he relives many good memories of his friends. He begins looking after my stuff as we travel and by the next morning he is much better. We took the van back to Tacloban, changing vans once at a transfer station. It was very uncomfortable as the back of my chair was broken but I stuffed my jacket there. It was a three- hour drive! Finally we arrived back in Tacloban and were relieved to finally see the military is arriving to halt looting and keep better order. The Robinson Mall was completely emptied as were most shops and stores and many homes, adding more misery for the locals. At Tacloban we are met at the van transfer station by the local Bishop Jimmy Casses in charge of Assemblies Churches. 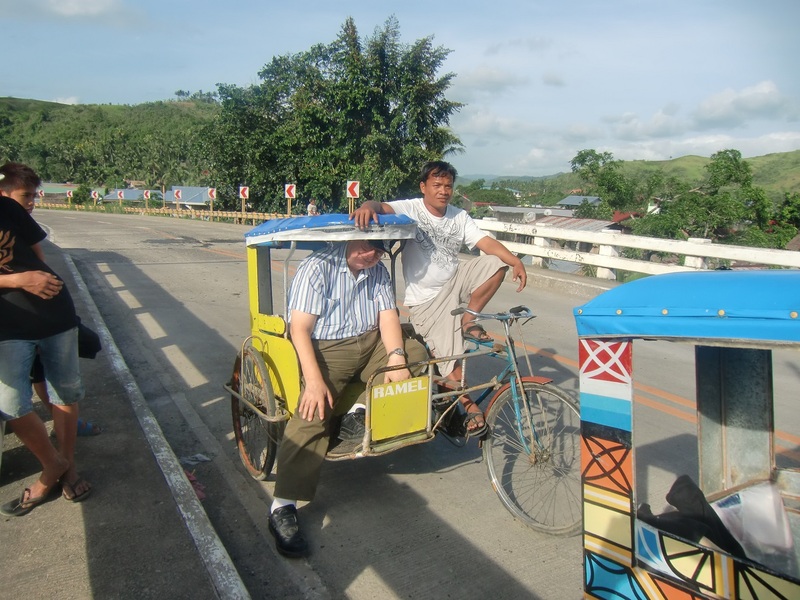 He took us in his car to meet Pastor Jimmy Libut of King Jesus Church Leyte, Philippines. His church is where our six LBC boxes were directed and arrived at his mother’s home the day before the typhoon hit. He drove us by the site of his church, now quarantined off, and is being destroyed as unsafe. The entire eight blocks are being leveled. Pastor Jimmy lead us on his motorbike through a web of open streets to reach his home, the Bishop followed with us in his car. It was tricky as wires and debris are everywhere. His house still has no water or electricity but his wife had prepared lunch for us of fish, dried fish, fish chowder, rice and mango (oatmeal). He told us the day after the typhoon, his church met at the church building and distributed the LBC boxes we shipped, as the first relief supplies. They are still overwhelmed by what God did. Pastor Jimmy gave me a CD rom showing the church and their appreciation. His church has about 20 families. He lead on motorcycle as we followed on rented tricycles, again wandering the streets finding our way through debris. Finally at the end of a boulevard, down a paved road, down a gravel and rock walkway, we reached his church, settled in a fenced compound surrounded by fenced off houses. The parsonage has one wall and a half or two other walls standing, with only the sink and toilet and some cabinets remaining. The ground is covered by mounds of debris and rocks. The adjacent church is standing but badly fractured. They have just completed installing a well and pump the day before, so they have water. They are living in a corner of the church, sleeping on pews, and cooking outdoors. A small gas generator is saved to use for services so only one emergency battery light is working in the church continually. He has four children: 17, 15, 13 and 7. They are all determined and in good spirits but finding it very hard on an allotment of just 25 pounds of rice a month AND 2000 PESOS ($50) TO BUY WHATEVER THEY CAN. We brought food and help for them like bread, water, rice, and bought some fish from the market. His wife told me about the harrowing experience when the storm hit. She was at her friend’s house with the children and Eric was in Cebu City, miles away. She said the house she was in was declared very safe and sound but instantly half the roof peeled away. She did not know whether to go outside to avoid the falling room or stay inside. She grabbed a door post with the four children hanging on to her in ladder-style and she was crying out to God when she looked around and saw all four children kneeling in the storm praying! Then she knew it would be ok, whether they lived or died! When the storm stopped, they returned home to find it, too, was destroyed. They are very brave and beautiful people. Cebu City is a culture shock after Tacloban and Omroc City, with the hydrofoil terminal modern and functioning. We are met by Pastor Charles and Mila who take us into Cebu to the Faith Full Gospel Center compound operated by Pastor Willie Navarette. He is 81 and the founder of the Faith Center Compound. When we called to ask if we could stay, he said to come for lunch and we will talk. When we arrived, he took an instant liking to me for some reason. He clung to me, holding my arm and leading me everywhere to see the compound. He says I can sleep in his room! After lunch he decided the rest can stay there too. He had a son hook up a microphone and had me preach to the neighborhood inviting all to church, etc. When I was resting, he came and got me out of bed and then he decided he needed my watch so he took it as well as half of my anointing oil supply. He is a lovable character! Bible school students take our laundry and do the cooking for us. Most of my time is spent talking with Willie! He got me up at 5 am. He woke me from my nap at 2 pm. You get the picture. The first night we went to Lapu-Lapu Island for a meeting. It is adjoining island where Magellan landed. The church was floating…..entered through a house path and up a gangplank! Built by Koreans, it is nice little church, packed with mostly adults. Later I find out 66 are pastors from nearby villages we cannot get to, so they came to us. I preached in Deuteronomy and about the founding of Caleb as this is what they requested. God was clearly with us as we prayed and prophesied over each one there! At the end, EACH came forward and testified to their healings, blessings and overwhelming joy! This was huge boost to our trip. When we got back, Pastor Willie repeatedly asked my assurance that he is part of Caleb Ministries! I finally wrote him a note to prove it which he then read over the loudspeaker (about 4 am). After breakfast we caught a cab and returned to Lapu Lapu to the home of Charles and Mila. There their son and daughter-in-law insisted on doing an ion cell foot detoxification procedure on each of us for toxins we might have from Tacloban and Omroc City. Then back to Pastor Willie and on to Cebu City Free Methodist Church (Light & Life Church) and Pastor Alan Prochina. It’s Thursday evening, so the service is the youth service which was great fun as I recounted many adventures and prayed over them. Even the Pastor and his wife were slain in the spirit! Friday we visited the Ramos Family Mansion which is a college, a nursing school, a Bible school, and a museum. We addressed a Bible class of about 20. I taught on the Garden at Gethsemane and the process of Jesus’ atonement for our sins. It is now rest time as we have church tonight. Friday night service was very exciting. We had a TYPHOON here in Cebu. About four in the afternoon they sounded the alarm and at six the second alarm which means get off the streets. It was a wild storm with rain hitting like rocks on roof. Many leaks in metal roofs. Service was sparse as travel prohibited so only those close by walked to the church. About 60 people. Pastor Willie and I alternating on the loudspeaker before, encouraging those who could to come. I preached on the Seven Places Jesus Bled for our Redemption. Then Marben and I anointed people. About 10:30 the storm got serious and we sent folks home. The power went out and our roof started peeling so we went to bed. Rain came through and it was funny trying to jocky for dry positions in bed. The Assemblies building is very strong so we did not worry about severe damage. Storm was over by morning and we held our pastors conference at 9 am as scheduled. Showed videos of Caleb Ministries and taught on church planting. Pastor Charles Roda from Palu-Palu came with his wife Mila. They reported that after we left the Pau Palu church Wednesday night (Floating church) the pastors were so excited they stayed up all night talking about the program! Marben and Beverly are in Toledo City in house churches today as Marlita and I minister here in Cebu. We visit the 4 Sq Church and Life Bible College in Cebu. The Pastor welcomes us and asks we find time to preach. He is excited to learn of our work and we have a fun visit on the chutrch campus. He sent out for burgers and fries for dinner and we have wonderful visit. Then he invited us into his home and introduced us toi his bride. He has invited me to stay anytime at their guest house. From there we visit Isabella Assmblies Bible College Campus where Pastor Willie taught fior 11 years. He is very proud and rightfully so of his accomplishments. Big communion service scheduled for me tomorrow morning (Sunday) and on radio as well so I will stop and rest. Very busy. Having a ball! Its like heavenly vacation! Flying Asiana Airlines (Korean), I found a pleasant surprise. The service was excellent and leg room ample. It was a most comfortable flight from Seattle to Seoul, Korea, taking just under 12 hours. But the overnight accommodations were very poorly coordinated. First, the promised free airport service was actually $67.00 by air porter bus or nearly $100.00 by taxi. It took 90 minutes to travel from Inchon airport to downtown Seoul were the hotels are, by bus. There apparently are NO Hotels or Motels or overnight accommodations in Inchon near the airport, forcing all overnight travelers to travel to Seoul. After arriving at the main entrance of several hotels, mine was the last stop for the bus service. The driver let me out with my luggage on a busy city arterial and said the Royal Hotel was to the right side. There were no signs of any Royal Hotel and just an alley with entrances to several underground garages, and one lighted ornate footpath. I guessed the footpath led to the hotel, so took it. It turned from boardwalk into stepping stones and in poor repair at that, making lugging my carry on and suitcase very awkward, with my cane. The steps took me up to a landing about 300 feet in on a hill, and turned out to be a memorial park with tables and benches, but a dead end to any hotel. I was now very tired but retraced my steps to the main arterial where the bus abandoned me. I asked several passersby for directions but they were not helpful. Finally, a security guard found me and showed me that the Royal Hotel was actually on top of the hill, facing the other direction. It had no signs or identification in my direction. He showed me the correct road, a steep hill, and I journeyed up to find the entrance lugging my suitcase and carryon. By now I was hungry and exhausted but the Hotel stopped serving food at nine, had no room service available, and no snack bar. I asked for arrangements for the morning for travel back to Inchon airport in time for my 7:45 am flight and was told the first free bus was not until 10 am so to catch my flight I would need a taxi. I ordered one for 5:30 am. Being hungry and exhausted, I had not eaten since lunch on the plane at 3:00, so I went to bed. The only English language TV was CNN. Water reached the top of the airport tower. The taxi back to Inchon was $90.00 but got me there on time. Asiana placed me in the “wheel chair lounge, promising to get me by 7:20 to check in for boarding at 7:45. They finally came for me at 8:25 and I just made it on the flight, arriving at Manila at 1 pm on Friday January 17th as expected. Pastora Beverly and Bishop Marben were there to meet me at the airport and we went direct to a Jollybee (I had not eaten since 4 the previous day!). There we met by prior arrangement with three Pastors including one from Tacloban, making arrangements for the journey there after Phil DeBorg arrives on Monday, the 20th. Tacloban suffered yet a second Typhoon last Saturday so arrangements for travel there were very limited. We were able to book our flight for this Thursday the 23rd but Phil must return the following Monday to make his flight back on Tuesday. From Jollybee we visited the church I will preach in on Sunday afternoon, the Peacemakers Church, which is hosting Wailing Women Worldwide Ministry on that day. Wailing Women is an international ministry of women intercessors. They are based on Jeremiah 9: 7-10 and practice fasting, intercessory prayer and sacrifice for others. The director here in Manila, Pastora Mileete, has attended their conferences in London, Nairobi and elsewhere over the years. It is my honor to be invited to address their conference here on Sunday service. Her husband graciously offers me the facilities of his church. He recently suffered a stroke so I prayed for him and we visited extensively in their facility, meeting many from the fellowship, school and orphanage. He and his wife have 2 biological children and 10 adopted children, the adoptees being from mothers who were seeking abortions! After our visit at peacemakers, we journeyed up the hills of Manila to Antipolo where we are staying in “One Goat Church”. This is the slum I stayed in last year and the mayor (Captain) sold us a plot of land to build a church for the price of one goat. The building is complete, having been put together by the team of young pastors from Maben’s Elohim Covenant Church in Santa Maria. It cost only $300 plus the supplies we already had on hand. It is a concrete block structure in the center of the slum, having one bedroom which is where Pastor Beverly lives. She insisted I use her bedroom for the trip as she slept with neighbors and Marben slept on the main room floor. There is a kitchen “area” of sink and propane burners, and behind the kitchen is a wall which houses a toilet-shower stall and buckets of water to flush or wash. Many of the people flocked in when we arrived, bringing eggplant and bananas as gift food. My bed is two house doors on a raised platform, covered by a sheet but no mattress. My body creaks today but I will become accustomed. I unpacked and we shared our breakfast of eggplant, fried eggs, friend Bananas and rice with many children as they wondered in and out to greet us. Saturday we went to Pinas-Pilla in the outskirts of Manila for church service. It was a small storefront church and favorite of Pastor Marben as he has known the Pastor since he first became an active Christian. For those of you who know his story, Pastora Mileete and the Pastor at Pinas-Pilla are the two who mentored Marben after he was shot by army forces in an ambush when he was trying to but armaments for the communist. These two are the pastors he stayed with for 48 hours after he escaped the ambush. They led him to Jesus and are ones who convinced him to surrender his rebellion and work undercover with the Manila Police while becoming a Pastor! It was indeed a privilege to meet and work with them. We have a revival meeting that evening in the storefront church with many slain in the spirit. Healings and new gifts were abounding and as we finished the Pastor declared the beginning of “The Flame of Revival”. He took us to a fancy dinner at a Chinese restaurant nearby and while eating Marben shared with me that the restaurant was on the very grounds where he use to bury his kidnapped victims align to extort money for the rebels! I had thought it was on Mindanao but it was here outside Manila! The locals do not know anything of the infamous past of the area, once called the “pumpkin patch”. As we got home I celebrated quietly as the farrow cats had entered our church home and ate all the dried fish! Sunday morning we held service in our own church in Antipolo, “Elohim Covenant Community Church Antipolo”. It was great fun seeing all the folk’s crowd in. I preached on Deuteronomy 30 and Isaiah 53. At the end of service a soup of ginger root. garlic, onions, rice and chicken, was served to everyone. Each week Beverly serves over 300 meals in Antipolo as part of the ministry of this church. Sunday afternoon we went to the Church of Pastora Marleeta, the Peacemakers Church Wailing Womens Conference. There we had a great revival. It was truly awesome. I spoke on my coming to Our Lord and the beginnings of Caleb Ministry in Romania. My sermon was on Jeremiah 9 in honor of their work as intercessors. We then begin calling people forward for prayer. Nearly all there participated as we prayed for each as they came forward. The church took a video they provided to us. At the end of service we were invited back for a private Monday Afternoon party to celebrate the 25th wedding anniversary of the assistant pastor and school administrator. After collecting Phil DeBorg at the airport at 4:30 am (we had to leave Antipolo at 2 am to make it to the airport), we rested and then went back to Pastora Marleeta‘s for the lunch. We were the only guests for the dinner, at her request! We shared many stories of our ministries, families and adventures. It turns out Pastorals’ father is the one who counseled Marben to leave the Communists and go into undercover work for the Philippine government and then eventually into ministry. Pastora Marleeta has offered to accompany us to Tocoblan and then the southern Islands as she speaks eleven dialects necessary for our ministering. Then I blessed their school and we returned to Antipolo for the afternoon. Tuesday was big Antipolo Service in our Elohim Church. This involves crowding all belongings into the bedroom, setting up chairs and benches, and cooking rice, ginger, garlic and onions for feeding the crowd. By 7 we are ready. Pastora Beverly opened and led worship, playing her guitar. I introduced Phillip and he preached on his work in healing prayer. My teaching was a refresher on Samson and Delilah (stay away from the things of this world of you wish to serve God) and then the central lesson was David facing Goliath. They seemed to like it well to have basic Old Testament Stories viewed in spiritual perspective and they were all surprised to learn why David took 5 stones to kill Goliath. Even Marben, Pastora Marleeta and Pastora Cora were amazed to find the answer is in 1 Chronicles 20 where the three brothers of Goliath and his father are also slain by David or his men. Wednesday we again took several of the young leaders of Antipolo churches to lunch at Jollybee to thank them for their service and further introduce them into Caleb Ministries. They enjoy these outings and view them as special rewards as we dine on Spaghetti, friend chicken and gravy, and rice. (Jollybee is similar chain of fast foods like McDonalds but very popular here and Philippine owned. Wednesday night we pack for the next two weeks as we have to carry just 7 kilos (14 pounds) on the airplane to Tacloban. My 7 kilos is in my computer bag with laptop, convertor, kindle, sermon notes, one pair of pants, 2 shirts, meds, and shaving gear! Must travel light. The airplane is specific on weight restrictions and we comply or do not fly! At midnight, Marben, Phil, Pastora Marleeta and I head to airport in dead of night, midnight! At 2:30 we check in and at 4:30 flight takes off with airplane fully packed. We arrive at Tacloban at 6 am. It is quite a shock as you land, as the airport and field and support buildings are in terrible condition still from the November 9th Typhoon that swept across and leveled this city of 200,000! Everywhere you look is devastation. Much of the town was on peninsula that the storm swept across in 20 to 30 foot level waves. Much of what was on or near the water is now impacted ACROSS THE BAY on the far shore with houses, boats and cars stacked up the side of the mountain! We are met by our host Engineer Elmo Mongrubon. He works for Bank of the Philippines, still closed here. His wife works for IRS, open as you would expect. He drives through town to the far side where his home is just a couple blocks from where the typhoon struck. Their personal damage from Typhoon Yolanda was from high winds, flooding and falling trees and debris. They fared better than 99% of the people. Over 6,000 bodies have been recovered with that many still missing 2 months later. There are villages of relief tents for workers and then of tarps and tents for displaced families literally everywhere you look. CNN has a tent headquarters followed by UN Relief, Red Cross, Church agencies and the temporary shelters. People stand in line at relief trucks as Red Cross passes out bags of rice, bread, water. People fight in line frequently and the question everyone has is how much longer the goods will be passed out. Uncertainty is everywhere. We pass a big field where over 1200 bodies were found scattered….and they tell of the living just walking through looking for loved ones, no longer reacting to the vast numbers of killed. In the part of town still standing we find a Jollybee Truck in front trying to provide spaghetti and bread with the restaurant behind a total wreck. McDonalds is boarded up and parts of refrigeration show through the collapsed roof. A mexi-grill restaurant is open but the line to get in is blocks long. Food prices and cab fares and gasoline prices have soared everywhere. Our hosts drive 30 miles to another town to shop and even there prices are inflated and supplies limited. They are most gracious and hospitable but we see we are a burden they do not need so stay just 2 nights and then move on. For breakfast they serve cinnamon rolls (like Pillsbury bake and serve) and coffee packets. For dinner it was cinnamon rolls, rice, and beef in oyster sauce. (I had my oatmeal). The next morning it was rolls, chocolate Nutella, one can fried spam divided among 12, and a tuna bread spread. Again, I had oatmeal which I was grateful I brought. For lunch, we luck out in getting into a Shakeys' Pizza, as there are six in our group and the owner wants large crowd. We discover quickly it is NOT feasible to hold meetings in Tacloblan as few buildings are standing and most have no power or water. People are still repairing their houses and do not want to come out to meetings. We visit several families directly, praying for the sick and comforting where we can. Elmo took us to meet his mother’s house. She is marvelous lady. Her other son is the host Pastor but he is in Cebu trying to get supplies. She is so excited to meet this mysterious person “Jerry Riess”. Six LBC Caleb boxes arrived at her home Nov 8th for her son’s church. She placed them in front seating area. November 9th the Typhoon Yolanda hit at noon. Her house was untouched! All around was devastation. Every house, car, structure on her street was severely damaged! On November 10th they took the six boxes to the church and opened and distributed the relief goods among their members, rejoicing in Gods Provision! They call us the first responders but I resist as it is nowhere comparable to the brave NYPD-NYFD but to these people we are a symbol of God’s love and protection. We see their church which still stands but with severe roof damage. There are limited supplies and no workers to help as all are taken by the relief agencies. Most streets are still not passable as telephone poles are snapped, leaning, or broken off everywhere. Tree limbs are still everywhere. Government agencies are not working together. The Federal Government is opposite party from local so help is very slow and uncoordinated. For example, ten days after the storm, temporary houses were built dormitory style ready for 400 families and another 600 were near completion but one government agency said they did not meet permanent living conditions so closed them from being used or completed! Tents and tarps are everywhere with families open to the elements in view of these shelters! One agency called Hope has started building small houses on an open field. They provide materials that cost $338 per house. Volunteers build the houses to show their skills so they will be hired. About a dozen of these houses are done. The ministry director is Pastor Jerry Lindblad. We met with him. His superior was supposed to meet with us but suffered a spider bite and is severely ill. We provided Caleb Funds for 4 houses. Even the General MacArthur landing monument on the beach is damaged. The adjoining hotel collapsed completely and now is used for gleaning wood. The monument is chipped and scarred but still impressive. We visit the International Christian Mission High school, a private school in Tacloban where our host’s son attends. The sports stands are collapsed and total loss. Windows were gone and all three levels flooded as the roof was blown off. Many classrooms are still useful and school will reopen tomorrow which is January 24th with half now useful from the November 9th storm! They are still awaiting windows and other supplies but are advised they are held up in Manila harbor by the flow of relief supplies. We have great visit and conversation with him. A blond Evangelical Swede, he is a pastor, founder of the school, and now supervisor for reconstruction. The main school is three flows with second floor being “shared” facilities of library, cafeteria, lab facilities, and audio-visual and faculty facilities. Ground level is elementary and top floor is junior high and high school. The library was DESTROYED and they are asking for any good Christian books. The Philippine Government is providing 10 roof panels per home as relief but one must find help to install, etc. The military troops arrive while we are here, a caravan of army troops. People are upset as it is so long coming. Following the Typhoon, most all stores were looted. Then a phony evacuation alarm was sounded and people thinking a tsunami was coming, went up the mountains. Gangs then came in and systematically looted hundreds of homes! Two months later, the army arrives to give order. Here we are hosted by Pastor Ramos and his wife Jezaniah, niece of Maben’s, and by his aunt! The Ramos has 4 children plus new gift baby abandoned to them. They operate six churches and two orphanages here. We are staying at one with 31 kids, the Aunt, and Ramos family. Lunch is egg-drop soup with tiny shrimp (oatmeal) and fresh rolls. Dinner is same followed by church service. I preached Deuteronomy 30. Phillip spoke on street ministry and Gods healing. This was followed by spectacular revival! All were slain in the spirit. It was surreal see the Spirit again working mightily! God is so good. Marben is having incredible time reuniting with distant relatives in this area as is Pastora Marleeta. We are contented, at peace, and very tired. Today, we visit orphans and then have youth service tonight. Phillip DuBorg left this morning after breakfast, on his way home.